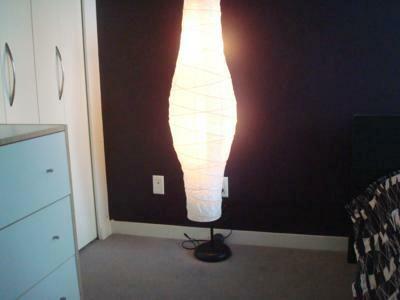 Welcome to this beautiful one bedroom apartment. This cozy place has been detailed, including bamboo flooring and a newly painted bedroom, is furnished with a modern taste and an artistic touch. Features are a gourmet kitchen with granite counters, four kitchen appliances fireplace, flat screen TV with surround sound system, wireless internet, and in-suite washer and dryer. The queen bed provides sleeping comfort for two. Two single sofa beds can accommodate another 2 guests. A medium size den has a desk and chair and is light and spacious being covered by glass on all sides, with 2 sides facing the bedroom and the living room and 2 sides being on the corner of the building, viewing to Robson and Seymour streets. 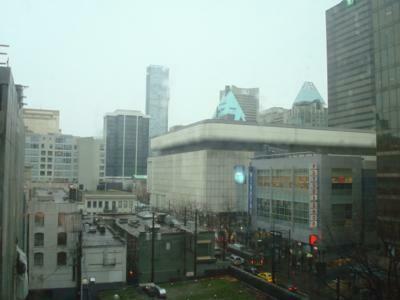 From this apartment you can view the Robson Square which is a short 5 min walk away and the cultural hub of the city. It houses the Vancouver Art Gallery, UBC downtown campus, an ice rink and the beautiful Robson square plaza with waterfalls, designed by famous Canadian architect Arthur Erickson. 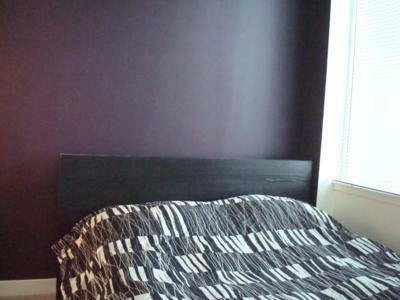 This stylish one bedroom apartment is on Robson Street. Enjoy the gym with exercise equipments as well as a large communal balcony, and also meeting rooms. The building is highly secured with 2 entrances, leading to a modern lobby to access the elevators as well as the recycle and disposal rooms. The Aria building is also equipped with a supermarket on the second level with a coffee shop as well as a food court. The building is adjacent to a parking lot, where overnight parking is allowed. There are also parking spaces along Seymour and Robson streets. The building is few minutes away from many restaurants. Korean, Japanese, Chinese, Mexican, Indian just to name a few. You will also have Coffee shops like Starbucks, Blenz etc. nearby. The L'Aria building is located on Robson Street the main shopping street and the most famous street of Vancouver. A stroll on Robson Street is a pleasant experience as many shops and restaurants are placed side by side throughout the whole street. It is also considered to be located at the edge of Yaletown in Vancouver - with all the shops and restaurants at your door. Yaletown is located on the False Creek's waters edge of downtown Vancouver. It is a trendy urban community comprising a mix of residential, office, restaurants, boutiques, cafes, microbreweries and galleries. Those embracing the outdoor lifestyle will love it. Yaletown's Seawall includes a mix of walkers, joggers, cyclists, and roller-bladders. The walk has many special features including extensive landscaping, lighting, artifacts, and green spaces. Head to the bottom of Davie Street to the waters of False Creek. There the 'Aqua Bus' leaves on a frequent schedule for destinations such as Granville Island, Stamps Landing and Science World. 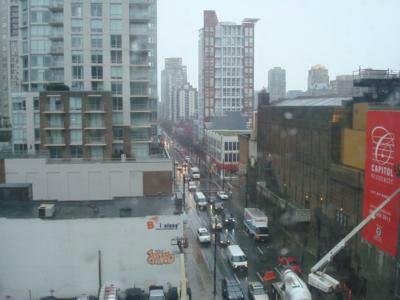 It is only a short block away from Granville Street, where many Olympic events are hosted. Granville Street will be a designated pedestrian pathway for the duration of the Olympics with various events and festivals happening on each block such as the German festival, lantern festival, pavilions, etc. You can enjoy the festivals and events in a 5 minute walk to Granville and Robson Street. Being centrally located, from this building you can be immediately outside and on Robson Street. This one bedroom apartment is 5 minute walk from 2 main SkyTrain stations, the station on Granville and Robson is 1 short block away and hosts the new Canada Line that goes directly to the airport in 23 minutes. Another SkyTrain station is located 1 block away on Seymour and Georgia with the old SkyTrain servicing to Metrotown shopping centre and other areas. Seymour Street is also the bus path where major bus lines pass through and you can catch buses to get to the Convention Centre and other areas around downtown. EMR was professional in all there services from start to finish. We felt comfortable from the start that the staff was setting us up in a great spot on Robson and that all financial matters were being handled securely, both of which were important to us as we visited from Pennsylvania and have never been to Vancouver before. Our room was exactly as pictured. Our visit to Vancouver was the best. Olympics were awesome. You should all be so proud of yourselves! There will never be another Olympics like that one unless it is in Vancouver again! Cant wait to come back!